Freeman's Country Supply is proud to be a family owned and operated business. Our family serving yours, since 1990! Duane likes tequila and watching the sun go down. He also enjoys spoiling his grandkids, napping, and spending time outdoors. Duane is a certified WETT inspector, and he's licensed to dispense veterinary medicine and pesticides, possess and acquire firearms, drive, hunt, fish, and operate spacecraft. Well, okay, maybe not the last one, but he sure is good at anything and everything. Joanne runs the show and keeps us all motivated. She has a supernatural way with numbers, so the rest of us are grateful that Joanne is in charge of orchestrating the books and accounting. She makes sure everyone pays up and gets paid. Joanne likes eating organically, attending her bi-weekly yoga classes, gardening, singing, and she especially LOVES being a Grandma. Duane & Joanne have been here the longest and pretty much know it all. 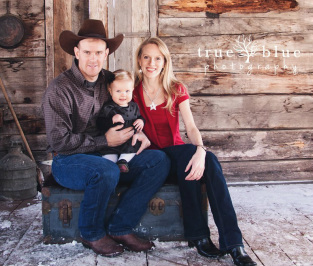 Having moved from the Douglas Lake Ranch in July of 2011, Nolan & Kendra bring a new perspective on many things. Nolan likes hunting, making beer and wine, and is passionate about his new-found hobbies, golf & curling. If you have any questions about feed, fencing, or basically anything to do with ranching, he's your guy. He completed his pre-vet in university prior to cowboying in Australia, Arizona and Douglas Lake, BC, and knows a thing or two about livestock. Kendra cheers Nolan on as he drives the forklift and does the heavy lifting around the store. She grew up on a dairy farm in Chilliwack, and she loves to ride horses, chase their young daughter around, do a little fishing, and recently discovered playing hockey is pretty fun too. Kendra has a diploma in Equine Science from Olds College, and certification in a few clerical skills. She has taken over the marketing and advertising, so she spends a little too much time in front of a computer. Norma has a dazzling smile, an infectious laugh, and is adored by all who meet her. She has a tendency to work too hard, and efficiently scratches things off the daily to-do lists at the store, where she has been with us since 2007. The shelves stay stocked because of this wonderful woman's way of getting orders placed asap. She grew up on a farm in Manitoba, and continues to raise animals and produce here in BC. If you need to know anything about chickens, Norma’s your gal. Much to the rest of the staff's relief, she knows her poultry! Norma likes chocolate, growing beautiful and delicious things in her garden, feeding and caring for her pets and livestock, volunteering as a Key Leader with 4H, and spending time with her husband Ray and their two children.